Walter Palmer, infamous for killing and decapitating Cecil the beloved lion of Zimbabwe last month, has had blood on his hands for years - and recently surfaced photos prove it. Through the Freedom of Information Act, ABC News uncovered photographs of Walter Palmer posing by a black bear he killed illegally in Wisconsin in 2006. 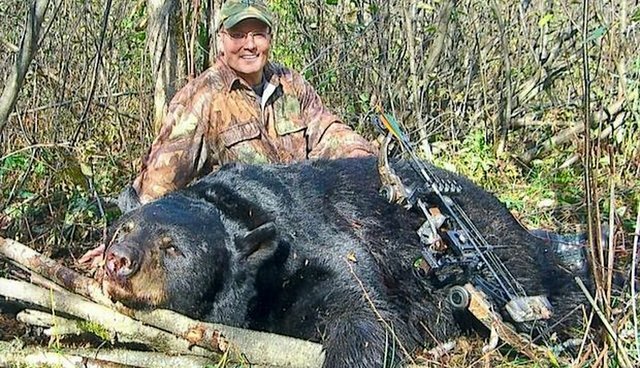 According to ABC, Palmer admitted to lying about the details of killing the bear, which he did in an area where he wasn't allowed to hunt. Then, Palmer reportedly offered to pay $20,000 to make others lie for him. "He was lying to us," U.S. Attorney John Vaudreuil told ABC. "He was offering to pay, it turns out, about $20,000 to keep the others who were in the hunt, to have them lie, so that's a fairly aggressive cover-up." Palmer pled guilty to the felony of killing the bear where he wasn't authorized to and for lying about it to the U.S. government; he got a year of probation and paid $2,938 in fines. That the Minnesota dentist killed other wild animals before Cecil comes as little surprise - but that the cowardly trophy hunter tried to cover up his heinous acts in the past - well, it just breaks our hearts even more, for Cecil, and for all the other innocent animals trophy hunters kill each year.